Having a roofing problem can affect your entire home. When water starts to leak inside your home it can not only damage the home itself but also contents of the home including furniture and electronics. Getting roof repair or a new roof installation in Howell Michigan can help get your roof back in working order quickly. 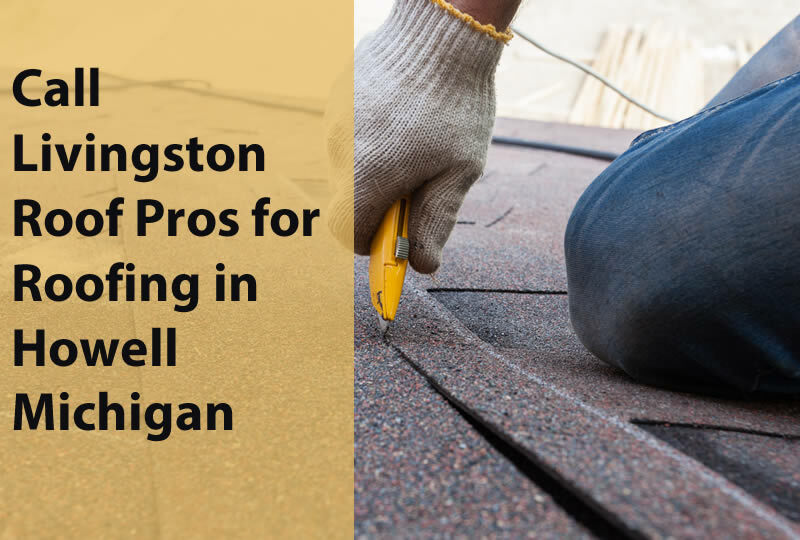 Livingston Roof Pros is one of best roofing contractors in Howell Michigan and we can repair or replace your roof quickly. Give Livingston Roof Pros a call today for more information about roofing in Howell Michigan and we’ll also give you a free roofing estimate for your roof needs. We offer many different roofing services for residential homes in the Howell Michigan and surrounding areas. So whether you need a small roof repair or a full roof replacement we can certainly handle it for you. I’ve went over some details below on why we are a great choice for your roofing needs in Howell Michigan and surrounding areas. If you have any questions or comments and need further clarification be sure to give us a call and we’d be glad to speak with you about your roofing needs or questions at 517-940-8770. If you have any questions or comments and need further clarification be sure to give us a call and we’d be glad to speak with you about your roofing needs or questions at 517-940-8770. We don’t keep banking hours. When you need roof repair for your home we’ll be there. We offer emergency roof repair services to protect your home when a problem arises. We can install temporary barriers to keep the rain, snow, and ice out until your roof can be properly repaired. Being able to stop damage from occurring on your home during this time can save you lots of money when compared to the damages that may be done to your home. When you need roofing in Howell Michigan be sure to call Livingston Roof Pros even when you’re faced with a roofing emergency. With storms seemingly getting worse and worse each year make sure your roof can protect your home as well with a roof inspection. When it comes to quality Livingston Roof Pros is at the top of the list. All the work we provide on your home’s roof is done per manufacturer and industry standards. We don’t cut corners and apply roof repairs that don’t last. Only in emergency roofing situations will the roof repair be temporary. We apply a more permanent fix once the weather lets up. We want to make sure our customers are completely satisfied with our work and the way we do that is by providing an affordable service that is done correctly the first time. Although asphalt shingle roofing is one of the most popular roofing systems used in Michigan today it’s certainly not the only type of roof. At Livingston Roof Pros we can service many different types of roofing systems including metal roofing and tile roofing. Give us a call today to learn more about our services for roofing in Howell Michigan for your particular roofing system. If you don’t choose Livingston Roof Pros for your roofing in Howell Michigan needs be sure to get a fully licensed and insured roofing contractor in Howell Michigan. Protecting yourself from scams and other problems means that you’ll want the roofing contractor to be fully licensed and insured. At Livingston Roof Pros we are fully licensed and insured and hold certifications from major roofing manufacturers as well. If you’re on a budget we offer several different roofing methods that can save money on your home’s roof. We offer both tear off roofing in Howell Michigan and re-roofing in Howell Michigan for your roofing needs. We can also install different shingles such as 3tab or architectural shingles on your home. Talk with one of our roofing professionals today to learn more about the roofing methods that may be available on your home from Livingston Roof Pros. Ready to get started on your roofing project? Give Livingston Roof Pros a call today to lean more about their roofing in Howell Michigan services and get a free estimate on your roofing project.